Found in FNA Volume 6. Treatment on page 220. Mentioned on page 188. Plants 1–2 m. Stems often red blotched, coarse. Leaf blades scarcely lobed to palmately divided, 10–25 cm, ± broader than long. Pedicels not articulated, stout; involucellar bractlets linear, to 2.5 cm. Flowers: corolla to 8 cm diam. ; staminal column anther-bearing from near base, apex 5-toothed. Capsules cylindric, slightly 5-angled, beaked, 8–30 cm. 2n = 72, 108, 118, 120, 122, 130, 132, 144. Introduced; Fla., Ga., La., Miss., N.C., S.C., Va., s Asia, Africa, sw Pacific Islands, introduced also in Mexico and elsewhere nearly worldwide. 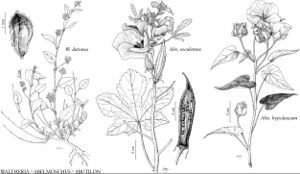 Abelmoschus esculentus is a cultigen, apparently domesticated in India for the edible, unripe, succulent, mucilaginous young capsule and edible leaves; it may escape from commercial and garden cultivation and sometimes persist in waste places. This page was last edited on 2 January 2019, at 22:15.